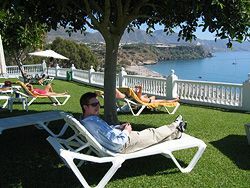 I just couldn’t have chosen better… Nerja was the perfect place to lie back and enjoy the very finest of the traditional Costa del Sol! There were lovely golden coves, beachfront tavernas, whitewashed buildings, fantastic sunshine and a backdrop of the dusty hills of southern Andalucía – it was a picture postcard of everything I could’ve hoped a coastal town in the south of Spain to be! I truly loved every second of my time in Nerja. After visiting so many of the larger, bustling cities of Andalucía, coming to Nerja was a wonderful, peaceful, relaxing breath of fresh air. Everywhere you go you can see Nerja’s heritage as a sleepy fishing village, with low-rise, white washed villas, cute mosaic patios, palm trees, and a lovely traditionally Spanish high street, where every store name ends in ‘–eria’ J … the panaderia, ferreteria, dulcerias, zapaterias, pescaderia… you won’t find ugly, neon clad chain stores in Nerja. It was charming and wonderful! Yet you still have absolutely everything you need, and if you were really and truly desperate for a big city ‘fix’, Malaga (which I spent a day in and really liked!) was only 40 minutes away! 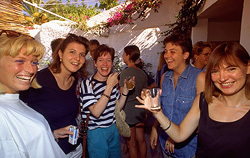 If you’re going to Nerja for your Spanish course this summer, then don’t miss out on the town’s fantastic festivals! Flamenco, opera, ballet, gospel and jazz… whatever your tastes, Nerja has a concert for you! You can buy your tickets to some of the best concerts at the school office, such as the José Mercé concert. Who is José Mercé? Well, he’s one of the great flamenco artists of modern times, and he’s coming to Nerja Thursday 26 July. A regular to Andalucía’s summer festivals, José started his recording career at the age of 13 and now is perhaps the most successful singer on the flamenco scene. What I really like about Nerja that even during high season with the influx of both Spanish tourists and foreign visitors, the town manages to retain its friendly, relaxed atmosphere. If you’re looking for Spanish charm and a place to relax, then Nerja is for you! It seems to me that the residents of Nerja enjoy the best of both worlds, living amongst a mixture of modern buildings and traditional whitewashed stone shops and businesses. Typically for a tourist town, there are lots of interesting shops that line both sides of the long pebbled streets selling local produce ranging from ornate sculptures to handmade jewellery. There are also family-run restaurants selling platos del dia (an inexpensive lunchtime menu, usually consisting of 3 courses including a drink), pizza, freshly caught seafood and home made ice-cream (which I would definitely recommend – especially the limón flavour!). My fortnight of fun in Nerja, on Spain’s Costa del Sol! I had the chance to take a Spanish course in Nerja, a beautiful Andalusian coastal town in southern Spain. Actually, I didn’t even know that this town existed until some friends of mine were in Nerja some months before. 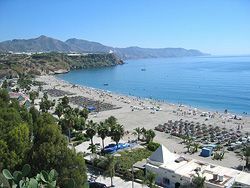 Located just one hour from Malaga, Nerja combines all the best characteristics for a person who wants to learn Spanish or just see Spain. The school is very nice, the teachers and staff at the school are friendly and approachable and helpful…and all of this, whilst enjoying Nerja’s secluded beaches, friendly people and continuous sunshine!